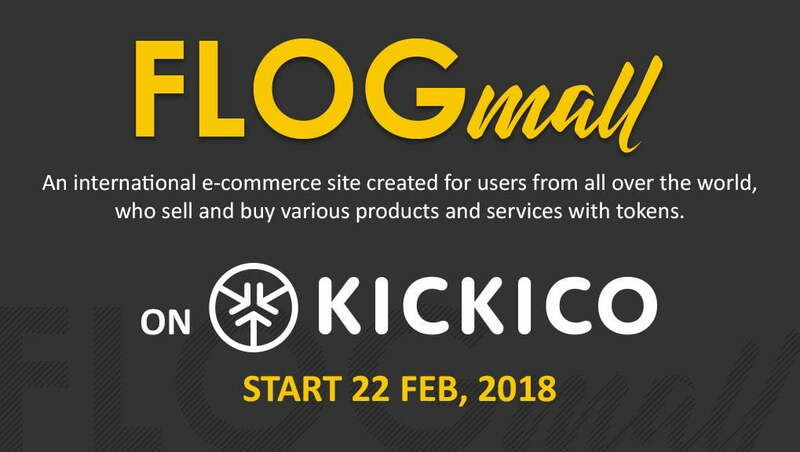 MOSCOW – FLOGmall has announced that its first public offering of tokens will take place February 22 – March 8, and that it will be launched on the KICKICO platform. The FLOGmall project is highly innovative in terms of hedging risk for investors. It has a built-in, automatic token exchange service, called ATES, with the primary task of hedging. FLOGmail is the world’s first online platform for buyers and sellers using cryptocurrency. At FLOGmall, one can find stores in a new, unique format – the LiveStore, a collection of video content and blogs about sellers, stores, goods and services. For investors, the most important feature of the launch is ATES, an analogue to an internal exchange with the most profitable rate for ICO participants. On FLOGmall, participants can buy and sell using any cryptocurrency; however, paid services for sellers can be purchased with Mallcoin (MLC) tokens only. When purchasing them at the pre-ICO and ICO stages, the early token-holders receive a discount. The possible benefits, ranging from 200% to 300%, are obtained when MLC tokens are exchanged for any cryptocurrency the holder chooses. The ATES system kicks in with FLOGmall’s launch. Holders “exhibit” their tokens on an exchange and determine their cost. The price is not expected to be lower than that of the original purchase. On the service itself, the official MLC rate will be specified. At the initial stage, it will equal 0.0001 ETH, which will be two times greater than the cost of tokens at the ICO stage. A user who wants to use the paid services of the website, but has not bought tokens during these stages, will need to buy MLC tokens either from the website at the official exchange-rate value, or from the early holders for the price the holders themselves set. The MLC will eventually be listed on the exchange like other tokens. The rate, according to the standard scenario, will rise or fall. In one case, the tokens “reach” the price determined by ATES, which is 0.0001 ETH, and the system will automatically “catch” the profitable price and will continue to increase it inside the website along with the exchange rate. In the opposite situation, when the MLC price on the exchange declines, ATES will “delay” it at the minimum level set by the website (0,0001 ETH). Therefore, even with a dramatic decline in value, with ATES, the rate will not fall below the initial cost. This hedging feature is entirely unique to FLOGmall. A website demo and a white paper can be found at: https://flogmall.com/.